machined to create an interference fit in the groove, or trepan, in the fitting nose. This trepan is machined parallel to the fitting centerline to eliminate the risk of twisting the Teflon seal out of its seat during assembly. 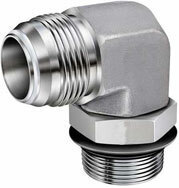 In most other respects, the UltraFlare resembles the SAE flared tube fitting (see "SAE 37° Flared Tube Fittings/Appearance" for additional details). Type SS 316/SS 316L stainless steel is the standard material on all bodies, nuts and sleeves. PTFE/Teflon is the standard seal material. shop or field, such as underflared tubing or under-torqued makeups. flared tube fittings. As such, for companies with an investment in tube flaring equipment and training, the UltraFlare represents a superior performing fitting system without the need for new capital equipment or technician training. In the field, or for system maintenance, UltraFlare tube fittings can be substituted for a standard SAE flared fitting for enhanced protection against leakage due to normal system vibration. Size Available (tub- ¼" – 2"